This is a program to create an image file in Java. The image is created from oval shapes filled with different colors. The image file is saved in your current working folder where the CreateImage.java file is. In this program, you learn two important things: using BufferedImage to store image data and using the ImageIO class to save the image data to a file in your hard drive. //Let the program close when the close button is clicked. 1 The BuffereedImage object must be created to store the image data. You will use the createImage(width,height) of the container object to create the empty BufferedImage object. 2 To draw things on the BufferedImage object, the Graphics2D object must be obtained by calling the createGraphics method of the BufferedImage object. 3 Set the color of the pen. 4 Create and fill the ellipse shape. 5 Display the image on the screen. 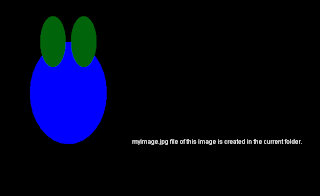 6 Create the image file called myimage.jpg in the current working folder by calling the write(BufferedImage, Type, File) method of the ImageIO class.